Padmavati, rescued from a 20-feet deep dry pit two days ago in a marathon exercise at Surajpur in Sarguja forest range, north Chhattisgarh, died during the course of treatment at the rescue centre. 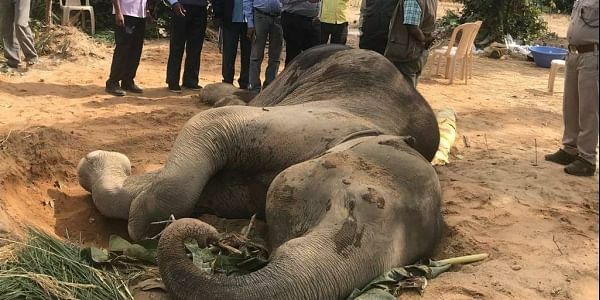 RAIPUR: Female elephant, Padmavati, succumbed to spinal cord damage and internal haemorrhage, two days after she was rescued from a 20-feet deep dry pit in a marathon exercise at Surajpur in Sarguja forest range, north Chhattisgarh. She died during the course of treatment at the Ramkola rescue centre in Sarguja. A team of three doctors performed the post-mortem on Saturday and found that the broken lumbosacral vertebra had resulted in the spinal cord injury that left the waist and the hind legs of the elephant numbed. The autopsy report cited a major internal injury leading to the haemorrhage. “The heart finally stopped functioning owing to the haemorrhage. There was, however, no external injury found”, the report further added. The state forest department carried out an operation ‘Padmavati’ to save the female elephant that fell into a dry well. “We ensured utmost care in our efforts to save the elephant right from lifting from the deep pit to bringing her to the rescue centre for treatment and proper attention. But two days later the injured tusker collapsed as her heart stopped working owing to internal haemorrhage”, C S Tiwari, the deputy director Elephant Reserve and incharge of elephant rescue centre, told the New Indian Express. Two cranes and a JCB loader machine were pressed into service to carry out the rescue process and lift the jumbo in nearly 42-hour operation at Surajpur about 330 km north of Raipur.